Recently, I had the pleasure of going through some old yearbooks collecting pictures and information for the Union High School website. I was amused by several High School events that had taken place in 1947 and someone on the yearbook staff had written about the events and described in detail. One event was the Halloween Carnival, which took place every year and continued on through 1960. Things changed from year to year but this is how the Halloween Carnival was described in the 1947 yearbook. On the night of October 31, which is commonly known as Halloween night, UHS was the center for a gala celebration. All kinds of funny looking creatures were to be seen….witches, goblins, ghosts, clowns, hula-hula girls, pirates, cowboys and the like. In the auditorium were booths for pitching pennies, ring the duck (and a live duck at that! ), fish pond, apple dunking and a fortune telling booth…to only mention a few. In the classrooms were the refreshments and the bingo stands. During the course of the evening the cake walks and the grand march were enjoyed. The pretty girl cake was won by Miss Charlotte Shirey. Miss Margaret Wiley was crowned as the Carnival Queen. She was presented a gift by the principal, O. Roy Parker. Another event was a pie supper. Usually back then, if you bought the pie, you would get to eat it with the girl that made it. December 6th found the seniors of UHS rushing madly around trying in vain to get everything done at once. They were sponsoring a pie supper that night. Finally all the last minute details were finished and the doors were opened. But much to the horror of the head person at the bingo stand, the corn (used in playing bingo) had been forgotten in the rush and the people were crowding at the door, eager to try their luck. Presently, the day was saved as three seniors offered to go for the corn and returned shortly. Since it was a pie supper, the main attraction was the auctioning of the pies, which was done by Marshall Ellison. Soft drinks, ice cream and hot dogs were sold on the side. Also there was a guess cake, a pretty girl cake and a cake walk. The Seniors cleared about ninety dollars. The next event was the Junior-Senior Banquet and Prom. The Juniors of Union High School entertained the Seniors with the annual Junior-Senior Banquet on May 6, 1947 in the High School gymnasium. The theme used through out the evening was “The Big Broadcast”. The gymnasium was decorated with pastel streamers, flowers and evergreens and on each end “Welcome” banners were hanging. In the center of the floor there was a “dummy” microphone, which was used during the evening to carry the “Big Broadcast” to the listeners. On the table were the place cards, memory books and napkins also carrying the theme. The menu consisted of: Tomato juice, Baked Ham, Pineapple slices, Scalloped potatoes, Green beans, Peas and Carrots, Olives, Pickles, Radish roses, Hot rolls and butter, Ice Cream and Cake. The Banquet was followed by the Prom during which everyone enjoyed the dancing. This true dream came to an end about eleven thirty, and a truly happy event has once more passed, which will always be a lasting memory for all those who attended. 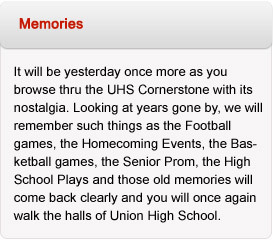 During the year of 1947, the events above were the highlights of their Senior year at UHS. As you read this I hope that you will enjoy going back in time to the year of 1947, as I did.